Click ''Photo Gallery' to view this item! Our Gift Set includes the Cuddlebabe wrap and our 14"x14" Blankee. 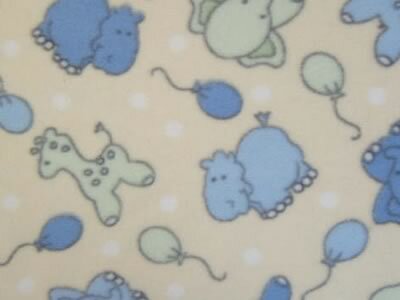 Our cuddly pastel yellow fleece is covered in baby blue and baby green giraffes, lions and hippos. Pretty balloons float in the background. This is our own custom original design! Machine wash & dry. Sizing: Newborn up to 26 inches in length (6 months) Sorry, Large is no longer available. The Gift Set also includes our 14"x14" Cuddlebabe Blankee in matching Zooey fabric. Our soft fleece is covered in light blue washable satin on one side and trimmed in the same silky satin. Perfectly sized for tiny hands who love to feel the satin against their cheek.